A contentious summit of Catholic bishops on family issues ended Saturday with a split verdict. A contentious summit of Catholic bishops on family issues ended Saturday with a split verdict, as conservatives beat back appeals for the church to sound a more positive note on gay and lesbian relationships while liberals appeared to prevail, albeit narrowly, on the issue of Communion for divorced and civilly remarried believers. Communion for the divorced and remarried was not addressed directly, but the gathering’s majority seemed prepared for a softening in how the church treats Catholics whose marriages have failed. Some had expected Francis’ synod to be a Vatican III, a reference to a gathering of bishops in the 1960s that launched Catholicism on a dramatic path of modernization and reform. This time, however, the changes appear to be more in attitude rather than content, and it may take years for their full significance to emerge. Overall, the results of the three-week gathering in Rome illustrate that the senior management of the Catholic Church remains divided over what Americans refer to as the wars of culture, and that Francis will probably face question marks no matter which way he eventually opts to go. Of course, the impact of the gathering’s conclusions can’t be measured until Francis acts on them — or doesn’t. Such a summit of bishops, known as a synod, does not possess any legislative authority, so it’s up to Francis to decide what to do with their input. He further admonished anyone caught up in theological rigidities and inclined to “bury their heads in the sand” while families suffer. This was the second synod devoted to issues of family life called in the last two years by Francis. It ran from Oct. 4 to Oct. 25, bringing together 270 bishops representing 120 countries and every continent. What to do about millions of Catholics in various parts of the world who have divorced and remarried outside the church was a towering concern. In the United States, there are an estimated 4.5 million. Based on Catholic teaching that marriage is “indissoluble,” divorced and remarried believers are barred from Communion. In recent decades there have been calls to rethink that stance, and Francis has signaled he is at least open to hearing the arguments. Both at last October’s synod and in this edition, the clash over the issue was fierce. Saturday’s result appears to leave the door open to some accommodation, though without providing specifics. While the document makes no direct reference to Communion, it calls on the church to consider if divorced and remarried Catholics can be included in areas of church life from which they’re presently excluded. “They are baptized, they are brothers and sisters, and the Holy Spirit pours out gifts and charisms on them for the good of all. ... Taking care of these people is not a weakness in [the church’s] faith and its witness to the indissolubility of marriage,” the bishops wrote. The document also suggests that such cases could be resolved through the “internal forum,” meaning permission for Communion could be given privately by a priest or bishop. 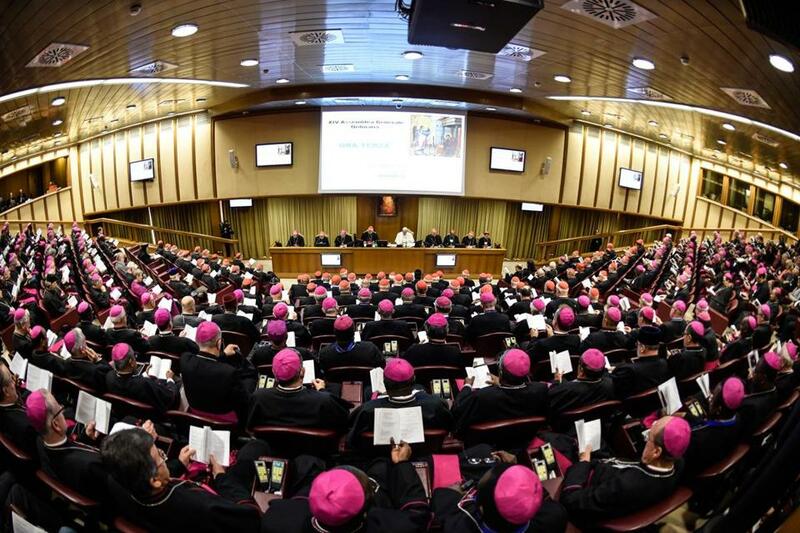 On LGBT concerns, the synod balked at offering a comprehensive treatment of the subject. Instead, it restricted itself to reiterating previous statements about the “dignity” of gay persons and the importance of ensuring they’re “welcomed with respect” and to calling for special attention to families with gay and lesbian members. At the same time, the document also rejects measures “that try to equate homosexual unions to marriage” and also echoes complaints of some bishops from the developing world that their societies are under pressure to “redefine” marriage as a condition of receiving financial assistance from donors in industrialized nations. During last year’s synod, some bishops had pressed for the church to acknowledge that gays and lesbians often live virtuous lives, even if Catholicism can’t treat their relationships as marriages. Such language does not appear in this synod’s conclusions. While all sections of the final document were approved by a two-thirds vote, the language on divorce and homosexuality drew significant “no” votes, reflecting the synod’s divisions. Another debated point had been the issue of decentralization in the Catholic Church, with reform-minded bishops arguing that matters such as the divorced and remarried could be handled at lower levels of authority. The final document does not treat that issue, again suggesting the absence of consensus. To be sure, there were matters on which the prelates found themselves in strong agreement. The document calls for more thorough forms of marriage preparation and greater efforts to support married couples after their wedding celebrations are over. The bishops also tried to strike a positive tone, insisting that living the Christian vision of the family isn’t rare or unrealistic but is widely practiced. For now, both sides in the synod’s debates can claim partial victory. Liberals seeking change can take satisfaction that the doors remain open, while conservatives who feared the church was on the brink of what one cardinal called “doctrinal backflips” can claim credit for holding the line. Going forward, the pope faces challenges on two fronts. First, he has to make decisions on the matters the synod has laid before him. The synod may have left him some wiggle room, but he now knows he would face doubts from a share of his own bishops whether he zigs or zags. Second, Francis faces the task of trying to put the church he leads — not to mention the bishops he relies on to do so — back together. He’ll need to convince his flock that such an honest airing of differences is not confusing or destabilizing but a pathway to renewal. The pontiff has another chance to frame the outcome Sunday morning, when he celebrates a Mass in tandem with the bishops gathered in Rome and marks the formal close of the synod. Then the bishops will go home, Francis will get down to work, and the real drama will begin. John L. Allen Jr. is associate editor of the Globe and Crux, the Globe’s website covering Catholicism. He can be reached at john.allen@globe.com. Follow him on Twitter @JohnLAllenJr and Facebook, facebook.com/JohnLAllenJr.